Chartering a boat in Ibiza has never been more popular. Groups of friends, families, couples, celebs – it seems everybody’s at it! In fact, private Ibiza boat charters are now firmly on the island’s ‘must do’ list of activities, just like the private villa parties of the past, which (sadly, some would say) are now much more strictly controlled by local authorities, with harsh fines often imposed for noise pollution. That’s just one of the reasons why those who go for a private Ibiza boat or yacht charter are ahead of the game – there are no noise restrictions at sea, you see! 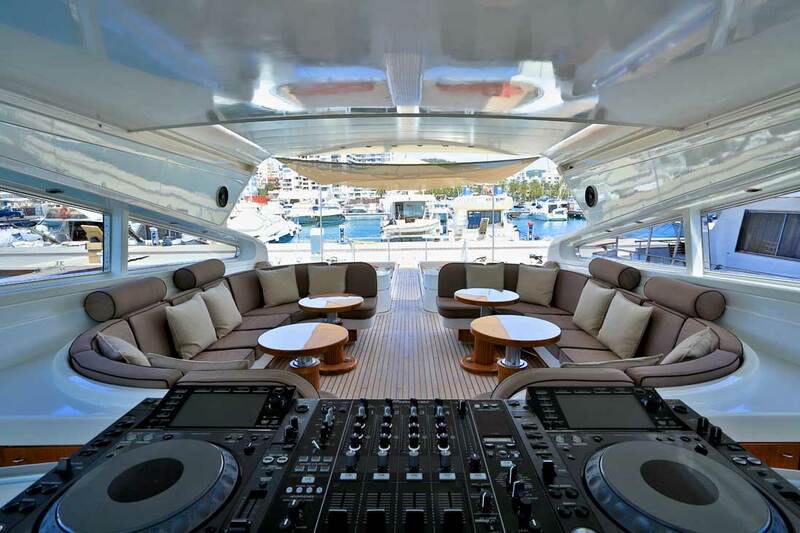 That’s why you’ll find powerful sound systems on some larger yachts, such as the Funktion One sound system that graces our 89′ Arno Leopard yacht, Disco Volante. USB connections are standard on all boats, meaning you can rock that yacht with your own personal playlist. Boom! 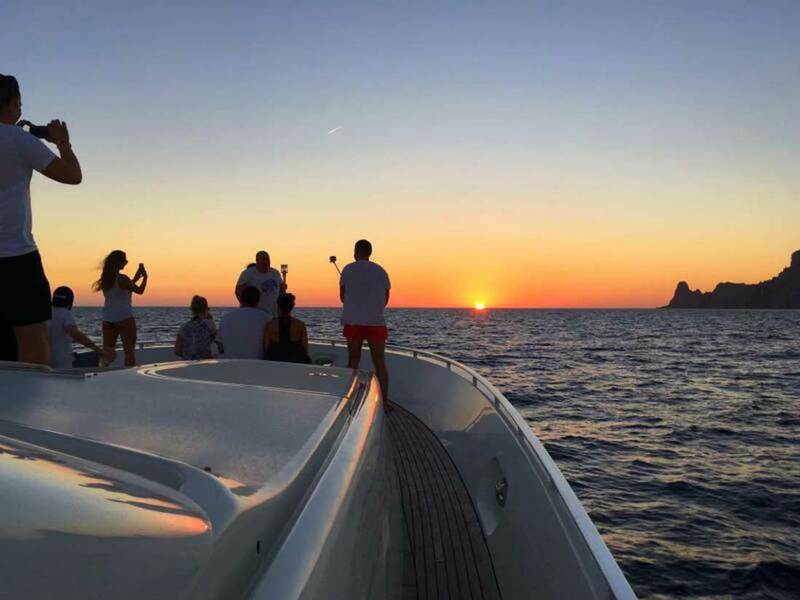 In short, there’s nothing quite like gliding across the Balearic on a private Ibiza boat charter with just your nearest and dearest. 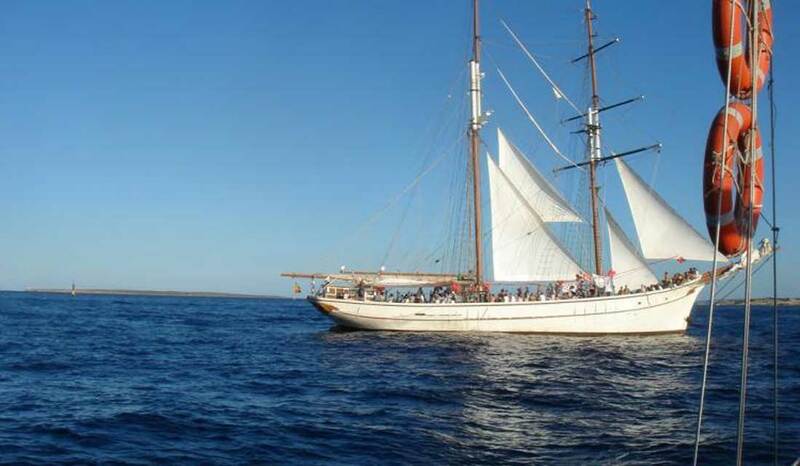 Ideal for groups who simply split the cost of the charter, a day out on the Balearic is much more affordable than you might imagine. 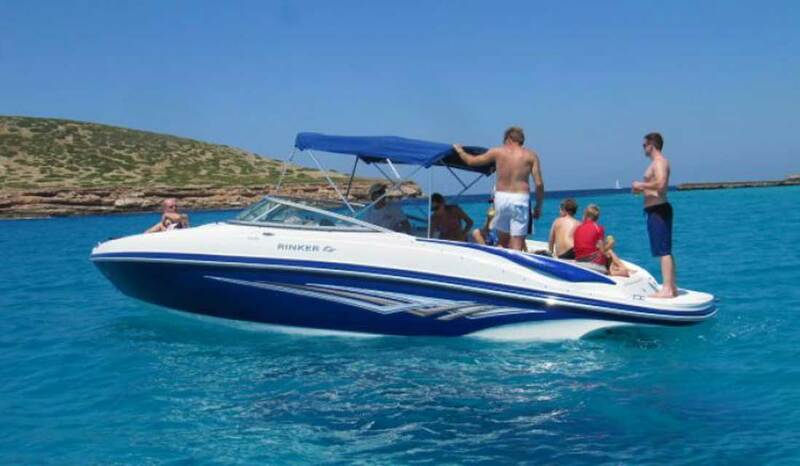 Groups of x 9, for example, can currently take out a super cool Rinker speed boat for less than €100 each. That includes a whole day (7 hrs) out on the water, watersports gear (wakeboard, waterskis, snorkels, donut etc), captain, instruction, IVA, 2 hours fuel and unlimited beer, wine and soft drinks. For a sunset trip (3.5hrs) the price per person goes down to less than €60 per head for a group of 9, with all the same perks included. What’s more, these are high season prices. Come mid-September, the prices get even lower. For special occasions, (hens, stags, birthdays etc) the current trend is to charter a Sunseeker yacht. A private sunset charter (2.5hrs) on our 47′ Sunseeker Camargue would cost a group of x 12 just €750 – that’s less than €65 each, fully inclusive of IVA, fuel, water-toys (stand-up paddles boards, snorkel, noodles), unlimited beer, wine and soft drinks plus complimentary Cava. An extra few quid each gets you a 49′ Sunseeker Portofino. Not bad, huh?! Of course, you can also go for the full luxury experience and spend the whole weekend on a yacht. Both the 89′ Arno Leopard, Disco Volante and the 60′ Sunseeker Predator have ample accommodation to transform into the floating hotel of your dreams. For those Ibiza boat virgins out there who’ve never chartered a boat before, here are 15 dos and don’ts to bear in mind. Choose a reputable, well-established company. Look out for the TripAdvisor Certificate of Excellence – a good indicator of quality. Check whether unlimited drinks are included in the price – obviously a huge bonus! Book in advance. You’re much more likely to get your preferred date and boat. Sign up for newsletters and follow your favourite companies on social media. That way, you’ll be the first to hear about special deals and discounts. Look for a price promise that refunds the difference if you find a cheaper deal. Ask about different routes (Formentera? Es Vedra? Hidden secrets?) Take advantage of your company’s local expertise and keep your eyes peeled for dolphins! Have lunch at a beautiful Ibiza or Formentera beach restaurant. Your charter company should be able to provide you with information about the best Ibiza beaches, bars and restaurants to visit. They should normally be able to make a reservation for you too. Be late. Every minute of your Balearic day out is precious! Thrown rubbish overboard – it’s dangerous and poisonous to marine life. Wear your shoes on the boat. Ask your captain to anchor over Posidonia seagrass or tolerate anyone doing this – the Posidonia is a World Heritage site and it’s highly illegal to damage it in any way. Weep when it’s over – just do it again next year! 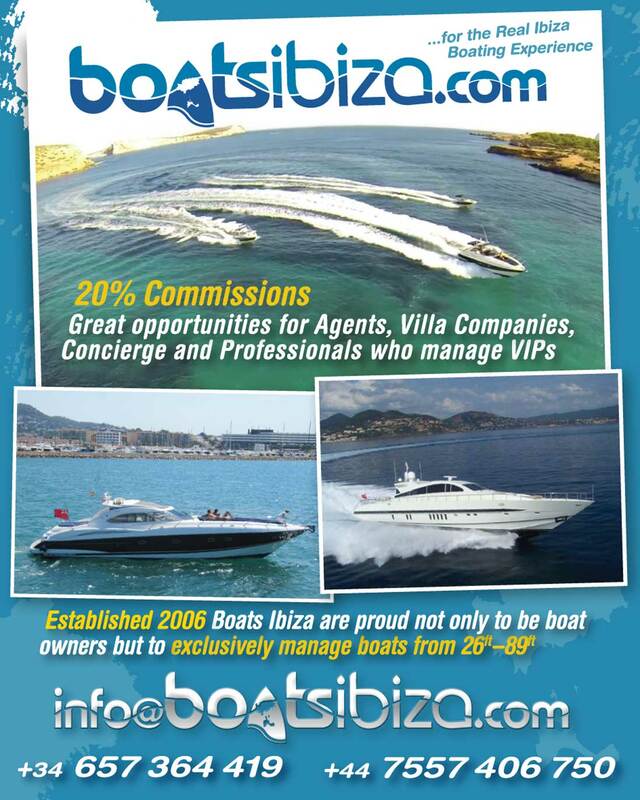 See Boats Ibiza advert below for full contact information—and details of the Commission introduction bounty.